The city of Pittsburgh has been buzzing since the news broke that their savior and captain Sidney Crosby is due for a 2nd return to the ice this season. Crosby was recently cleared for contact and eyeing a much anticipated return to the Penguins’ lineup. Any team would take Crosby back in their lineup at a moment’s notice, but the Pittsburgh Penguins are on an absolute tear climbing the Eastern Conference ladder. The Pens have won 20 of their last 25 games currently on an eight game winning streak and have defended their home ice well. Trailing the Eastern Conference leading New York Rangers by more than 10 points for a big bulk of the season, the Pens sit four points back with two more games against the Rangers before season’s end, including a match-up against the Rangers at Madison Square Garden on Thursday. The match-up against the Rangers may possibly be Crosby’s return to action. There has been plenty of anxiety concerning the return of Sid the Kid while the Penguins are clicking and playing some of their best hockey of the season. No one knows what the line combinations will be, what the power play will look like and how it will perform once the Pen’s captain hits the ice again. Head Coach Dan Bylsma is going to have no problem finding a place for Crosby on the roster, but there has been plenty of speculation as to what the forward line combinations will shape up to be upon Sid’s return. There has been even more surmise as to who to take off of the Pen’s power play and where Crosby should play on the man advantage. “The thought of putting Sidney Crosby in the mix there and having the best player in the world in that mix as well, is certainly a good thing to ponder. Sid has been working hard. We certainly welcome it sooner rather than later,” said Coach Bylsma. The Crosby-less Pens represent the 7th ranked power play in the league. Evgeni Malkin is quarterbacking the Pen’s PP unit on the right half boards where Crosby likes to set up shop. Despite those who feel Bylsma should create two evenly stocked power play units separating Crosby and Geno, there is no doubt Crosby is going to be placed on the 1st power play unit even though the addition of Crosby may not improve the chemistry of the power play. Malkin and Crosby have never orchestrated a successful power play unit on the ice at the same time. We have witnessed their inability to lead a successful power play together over the past three or four seasons. Right now though, the power play is in a slump going 0-15 in their last five games. Adding a talent like Crosby, and a Norris Trophy caliber defenseman like Kris Letang, may be the spark the power play needs to get going again. Chris Kunitz expects to be the player who is demoted from the top unit. Crosby will more than likely fill in on the goal line in the right corner and interchange with Malkin at the right half wall. Before removing Kunitz from the 1st unit, Bylsma should think about awarding Kunitz some 1st unit PP time when Crosby returns. Everyone thinks keeping Neal on the power play and removing Kunitz is the right decision since Neal has 30 goals and is 2nd in the NHL with 13 PP goals. However, since Neal signed his new six year contract extension on February 19th, he has not registered a goal. This is a span of nine games which is Neal’s longest goal scoring drought of the season. If Neal doesn’t start scoring at a consistent pace again, Bylsma should consider having Neal and Kunitz split time evenly on the power play. Neal is on a power play goal scoring drought as well. He has not cashed in a PP goal since January 24th. The power play needs a player to park in front of the net to create screens on goaltenders. Creating screens is not Neal’s specialty but something that Kunitz is spectacular at providing for the Pen’s power play. Neal is better at floating in and out of the soft spots in the slot. While these power play decisions hang in the balance, Bylsma also needs to find two wingers for Sidney Crosby to gel with when Crosby makes his second homecoming. Crosby was asked who he would be most comfortable playing with and if he would lobby to play with certain forwards. “Everyone is playing really well at this point. It really doesn’t matter to me. I just want to be back out there with them,” answered Crosby. The decision to keep Malkin, Neal & Kunitz together as the Pen’s top scoring line may seem to be a no-brainer considering the offensive numbers these three have posted to this point in the season. 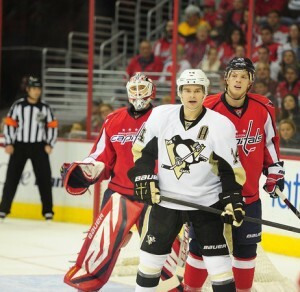 “Kunitz, Malkin and Neal have played spectacular and been possibly the best line in hockey for 2 months,” said Bylsma. Lately though, the MNK line has cooled off drastically despite the seven game winning streak of the Penguins. They have only 10 goals in their last 11 games which is way below the production they were giving the Penguins for the past couple of months. The MNK line has displayed unbelievable chemistry, but Kunitz had the same sort of chemistry when he played on Crosby’s wing when Sid made his debut in November. Once Crosby makes his way into the Pen’s lineup, Bylsma should place Kunitz on Crosby’s line. Kunitz has played with Crosby many times in the past, and Sid had 12 points in eight games with Kunitz as his winger earlier this season. Pascal Dupuis was the other winger who played with Crosby for Crosby’s short eight game stint. With the way that Dupuis has performed lately, he deserves to play on a scoring line with Crosby and Kunitz. Taking Kunitz off of Malkin and Neal’s line shouldn’t hurt the team one bit. Malkin and Neal were very successful playing with Steve Sullivan earlier in the season before Crosby was put back on injured reserve. Sullivan has been dependable and played outstanding all year long and especially lately. “Sully has been on fire since the all-star break. He’s been flying and he’s deceptive. He’s a great passer and he can also score some big goals,” said Neal. The top three lines may finally be put together how General Manager Ray Shero envisioned them: Neal, Malkin & Sullivan; Dupuis, Crosby & Kunitz; Matt Cooke, Jordan Staal & Tyler Kennedy. Everyone hopes the team camaraderie will strengthen with Sid the Kid’s return and that Malkin can keep up his MVP-type season. Geno has always seemed to take a back seat to Crosby on the score sheet when Crosby is playing. If Crosby and Letang make their way back into the lineup, and the Penguins could miraculously keep their core players healthy for the remainder of the year, the Pens will be favorites to win the Eastern Conference once the playoffs start no matter what place they finish the regular season.